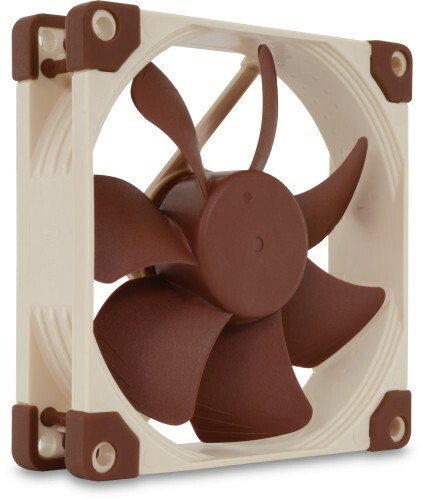 Noctua's new 92mm fans have been updated to feature their innovative technology. The NF-A9 PWM offers automatic fan speed control when connected to a PWM fan header on the motherboard. The NF-A9 is a highly optimised, premium quality quiet 92mm fan. Featuring Noctua's AAO (Advanced Acoustic Optimisation) frame as well as sophisticated aerodynamic design measures such as Flow Acceleration Channels, the NF-A9 further improves the renowned quiet cooling performance of the award-winning NF-B9. The PWM version sports Noctua's custom designed NE-FD1 IC for fully automatic speed control via 4-pin fan headers and comes with a Low-Noise-Resistor Adaptor to reduce the maximum speed during PWM control from 2000 to 1550rpm. Its superb running smoothness, reference-class SSO2 bearing and Noctua's trusted premium quality make it an elite choice for the highest demands. Have this in a small PC build (Streacom F7CWS case) and together with a Noctua CPU cooler, it is doing a great job of keeping everything in the box cool including an i7 8700 with very little noise. Replaced all 5 fans (chipset, RAM, HDD, PCI & PSU) in my 2010 Alienware Aurora R1 with Noctua units. Well worth the money. Machine is practically silent now and internal temps are down by at least 10 degrees C.